Epson announced an update on Monday to its Moverio smart glasses at Mobile World Congress in Barcelona, bringing a nice but incremental enhancement to a device that’s aimed at enterprise users and consumers alike. The new Moverio BT-300 headset got a major upgrade in the form of organic light emitting diode (OLED) display technology. Using OLEDs allows the black parts of the glasses' displays to appear more transparent to the user. That means applications that want to mix digital and physical objects work better with this new headset. That’s important for appealing to users who need to use the glasses while working. I tried out a demo of a prototype of the glasses prior to this announcement, and while they are clearer than the BT-200 model, it still looks like there is a gray box floating over the world where the glasses’ displays are. On the raw technology side, the BT-300 also received an upgrade to Android 5.1 Marshmallow, along with a bump to a quad-core Intel Atom X5 processor. The glasses also include an upgraded 5 megapixel camera, which allows users to relay a first-person view of what they’re seeing. The smart glasses can also use the camera to determine the placement of objects in the room, and the BT-300’s projection system is supposed to be able to render and lock 3D content to those objects. In addition to that, the BT-300 is lighter and smaller than its predecessor, which means that people will have an easier time wearing it for extended periods. It’s a marked difference from the glasses’ first incarnation, which was a massive, heavy headset. 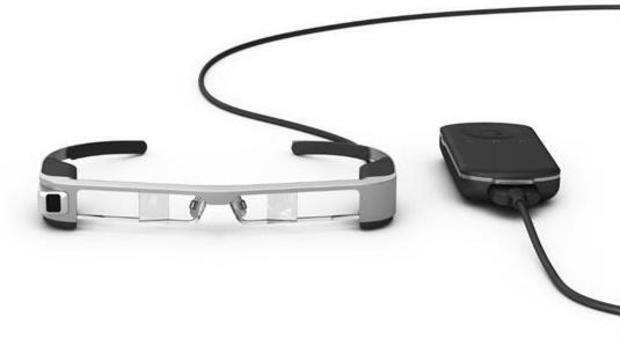 Users still interact with the headset using an external Android touchpad, which is connected to the glasses by a cord. It feels somewhat unwieldy, like using a mouse to try and control a screen that’s several feet in front of your face. Still, that allows the glasses themselves to be fairly light, which is a benefit in its own right. Epson initially released the Moverio glasses with the aim of attracting an audience of consumers who wanted to get the benefits of a big screen TV in small apartments without actually having to use up wall or floor space to see it. While that audience still exists (especially in Seiko Epson’s home market in Japan), the company is pivoting slightly to try and also reach other users, especially in the western enterprise market. The company may seem like a curious choice for a smart glass manufacturer, but Epson is also one of the world’s leading creators of digital projectors. It’s that skill and know-how that makes it possible for the company to build these glasses. The headset will be broadly available in the later part of 2016, but people who are interested will be able to pre-order it soon. Epson hasn’t finalized the pricing for the device, but the BT-200 costs $699, and the upgraded version will likely cost something similar.